When was the last time you had a "rainforest picnic"? Or even, perhaps, an "all-day Amazon breakfast"? Next time you are in a supermarket picking up a chicken sandwich for lunch, or fancy tucking in to a hearty breakfast of eggs, sausage and bacon before setting off for work, spare a thought for the Amazon. A new report by Forest Footprint Disclosure reveals for the first time how global business is driving rainforests to destruction in order to provide things for you and me to eat. Consumers "eat" rainforests each day - in the form of beef-burgers, bacon and beauty products - but without knowing it. The delivery mechanism is a global supply chain with its feet in the forests and its hands in the till. Governments, which claim to own 70% of them, create prosperity for their nations through this process, but poor forest communities need their forests for energy and food. The report shows that the EU is the largest importer of soy in the world, much of it coming from Brazil. 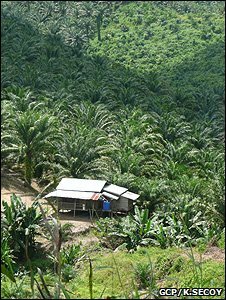 It also shows that after China, the EU is the biggest importer of palm oil in the world. Soy provides cheap food to fatten our pigs and chickens, while palm oil is in everything from cakes and cookies, to that fine moisturiser you gently rubbed into your cheeks this morning. I have become a bit of a bore in supermarkets, challenging my kids to hunt for soy lecithin or palm oil (often disguised as vegetable oil) on product labels. You should try it! The stuff is everywhere. The gargantuan farms of Brazil's Mato Grosso State can boast 50 combines abreast at harvest time, marching across monoculture prairies where once the most diverse ecosystem on Earth stood, albeit in some cases many years ago. Few Europeans know that their fine steak au poivre or choice after dinner mints might have an added expense on the other side of the world that unknown to them, is altering life on Earth. None of this would matter but for three things. Firstly, evolution is being changed forever. Most of us, sadly, can live with that. Finally, losing forests may undermine food, energy and climate security. Yet saving them could, according to UN special adviser Pavan Sukhdev's forthcoming review on The Economics of Ecosystems and Biodiversity (TEEB), reduce environmental costs by $3-5 trillion per year. Oh yes, let us not forget the 1.4bn people, many of them the world's poorest, who depend on these forests for their survival and who cannot afford to lose them, even if we can. So what can be done? The first thing is to encourage business to mind its "forest footprint". The impact global business has on deforestation will be a key factor in halting deforestation in the future. No amount of hand-wringing in the UN climate talks will alter action on the ground unless the drivers of global deforestation are also tackled. 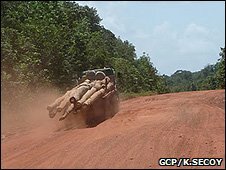 Whilst poverty is possibly the largest of these drivers, so is the way in which business drives the conversion of cheap forest land to feed their global commodity supply chains - all the way to you and me. This is why we launched the Forest Footprint Disclosure project last year: to invite companies to first recognise their impact on forests and then disclose what they were doing about it. Such a request might be ignored by giant businesses if it were not for the fact that investment managers, with at least $3.5 trillion of assets, also wanted to know and backed our disclosure request with their names. Why? Because it is their money that may be at risk if the companies do not clean up their act. In 2009, Amigos da Terra's report Time to Pay the Bill, and Greenpeace's Slaughtering the Amazon highlighted the cattle industry as a driver of climate change responsible for the bulk of Brazil's greenhouse gases through deforestation and methane emissions from 180 million cows. This resulted in the withdrawal of a $60m loan from the World Bank's International Finance Corporation to Bertin, Brazil's largest exporter of beef. In June 2009, Brazil's major supermarkets - Pao de Acucar, Wal-mart, and Carrefour - all announced they would no longer accept beef from ranches involved in deforestation. In July, sportswear manufacturer Nike said it would not accept leather in its products from Brazil if it came from deforested areas. And in October, JBS Friboi, Bertin, Mafrig and Minerva - the largest players in Brazil's cattle industry - all agreed to similar action. Daniel Azeredo, a Federal Public Prosecutor in Para State, has recently filed legal actions totalling $1bn against 22 ranches and 13 meat-packing plants for non-compliance with federal laws governing deforestation. The effects are rippling all the way up the supply chain - well, to you and me again. Consumers and businesses can play their part by demanding that their suppliers know where their "Forest Risk Commodities" come from. But will they? Evidence from certification schemes shows that consumers care but not enough to get their wallets out. If business cannot secure a premium for the extra costs of producing the good stuff, why should they bother? I believe, however, that we are at an extraordinary time in human history when all that could be about to change. What all this is evidence of is a quickening step in a remarkable journey that will result in nothing less than the transformation of the 21st Century economy. Curbing emissions from deforestation, which was the outsider in the UN negotiations just two years ago, has moved to become the front-runner. It is now widely recognised that forests offer the quickest, most cost-effective and largest means of curbing global emissions between now and 2030. So, are we at a tipping point in history where this could actually happen? Conservation will never out-compete commerce with a global population rising toward nine billion. Feeding and fuelling our growing world is one of the greatest opportunities of the 21st century, but sending natural capital up in smoke and squandering ecosystems that support wealth creation in the process will, ultimately, be counterproductive. Businesses that understand this will be the rising stars of the future. Our report provides some of the first insights into who the potential winners and losers may be, and which business are setting the pace today. Investors will want to spot them.